An Islamist activist honored by the White House last December as a "Champion of Change" called Zionism "racism" this week and said "nothing is creepier" than the belief in a Jewish homeland. Sarsour, director of the Arab American Association of New York, is on record defending terror suspects, casting skepticism over law enforcement investigations and advancing conspiracy theories. Despite her access to the administration, Sarsour describes support for President Obama as a "lesser of two evils" proposition for Muslim voters. She also believes there is a government conspiracy against Muslims and that the authorities were behind Malcolm X's assassination. 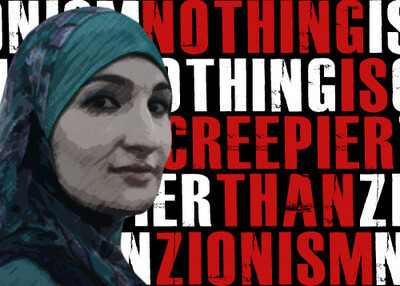 During a Feb. 23, 2012 interview with Russia TV, Sarsour claimed that "Islamophobia" today is a continuation of the genocide of native Americans and the slavery of African Americans. "This has happened throughout the history of our country; our country was based on, you know, genocide on native Americans, based on slavery, racial profiling has existed for centuries in this community," she said. During the same interview, Sarsour cast Malcolm X's assassination as part of a New York Police Department conspiracy which uses informants in the same way today. "As a matter of fact, on the chief body guard of Malcolm X was an NYPD informant," she said, "and we know that Malcolm X was assassinated in cooperation with the government, so it's very, for me it's just a continuation of history." The occult hand of government lurks behind many corners in Sarsour's world. In May, she dismissed reports about an al-Qaida plot to blow up an airplane using a more sophisticated, more difficult to detect, underwear bomb. Rather than celebrate this outcome, Sarsour leapt to a false conclusion, claiming that in a May 8 Twitter post that it was a CIA inside job. 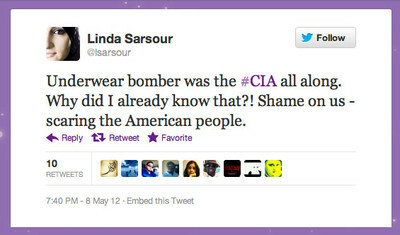 "Underwear bomber was the #CIA all along. Why did I already know that?! Shame on us - scaring the American people." In fact, the bomb plot was quite real. The would-be terrorist turned out to be an informant for Saudi intelligence. When he took possession of the bomb, he promptly gave it to his handlers, averting a deadly attack and giving Saudi and American intelligence a chance to dissect the latest attempt for terrorists to evade security. Because he had travel papers and seemed willing to be a suicide bomber, the Washington Post called the informant "a perfect dangle, in the parlance of spycraft, and al-Qaeda in the Arabian Peninsula took the bait." But it fits with her view that there is "War on Islam" led by the United States. That narrative is considered among the most effective messages in radicalizing young Muslims. "The value of Arab life - whether nameless Palestinian children bombed by American-funded fighter jets or American youth profiled, questioned and incarcerated for frequenting a particular mosque - is spiraling downwards rapidly in the US and at a more accelerated rate in the Arab World," she wrote in a March 22, 2012 Al-Jazeera English opinion piece. She demonized law enforcement at a 2010 panel discussion at the Islamic Society of North America's national convention. "So I think that we need to be clear that when, in any case it's not just the FBI that, really the resources are not in the FBI. … The resources are in our local communities and the NYPDs, LAPDs and the local organizations. So those black unidentified cars are probably 99.9 percent not FBI. They're actually probably Intel. So I want to make sure that people understand that this is not a watch out for the FBI. It's watch out for all law enforcement, whether they're ICE, FBI, local NYPD." During a question and answer session at New York University with White House terrorism adviser John Brennan two years earlier, Sarsour lamented the Patriot Act and cast the arrest of terror suspects as an unjust and everyday occurrence in the Muslim community. "I mean the Patriot Act is now going to be reauthorized as part of our job creations bill with no open debate or opportunity for amendment," she said. "Looking at cases of Fahad Hashmi, Aafia Siddiqui, Siraj Matin (sic), these are things that are happening every day in our community." The record does little to bolster Sarsour's argument. Hashmi pleaded guilty to conspiring to provide material support to al-Qaida. Siddiqui, known as "Lady al-Qaida," was convicted of attempting to assault and murder American officers in Afghanistan. Prosecutors say she grabbed an Army officer's M-4 rifle and fired it at another officer and other members of a U.S. interview team at an Afghan police compound in July 2008. And the Second District Court of Appeals upheld Matin Siraj's conviction in connection to a plot to blow up the Herald Square subway station. But it is her Palestinian advocacy that seems to set Sarsour most at odds with American policy and ideals. She expressed misgivings about Saddam Hussein's 2003 capture by American forces in Iraq, saying she felt humiliated by his appearance because he was a hero to Palestinians. ""I think he's done a lot of things he shouldn't have done, but I was hurt. My Arab pride was hurt," she said. "Palestinians are under so much oppression and no other Arab country ever helped them." There is little in Sarsour's record to indicate introspection about Palestinian actions that have made peace more difficult to attain. She does not condemn Hamas leadership, its history of suicide terrorism or its indiscriminate firing of rockets at Israeli communities. Instead, she promotes videos like the one on her Twitter feed Wednesday. The video, "Normalize This!" by poet Remi Kanazi, offers an uncompromising attack on Israel and its advocates. "No! I don't want to normalize with you," Kanazi says. "I don't want to hug, have coffee, talk it out, break bread, sit around the campfire, eat s'mores and gush about how we're all the same. I don't want to share the stage, co-write a poem, submit to your anthology and talk about how art – instead of justice – can forge a better path." "Your dialogue group, it's a breeding ground for injustice. Just look at the board members and the ZOA sponsorship. Zionism is a real demographic threat." Sarsour, the White House "Champion of Change," directed her followers to this message twice on Wednesday. It's certainly within her right. But any notion that she's a responsible and moderate voice for the Muslim community, one worthy of access to the halls of power, ignores a darker, extreme record. Zionism is creepy? Creepy? Is she fooling herself? Personally, there is nothing more creepy than a people so sadistic that it cuts out the female sensual /sexual area of it's women with either a rusty razor blade or does it "professionally" in one of their hospitals and then measures the width with a match stick so that they cannot even relieve their bladders like a normal human being.....Apparently Ms. Sarsour does not find THAT to be creepy.. Neither does she find creepy, the practice of "honor killings." Sounds to me as if she were reciting the Narrative of Perpetual Palestinian Victimhood. "Poetic truths like that are marvelous because no facts and no reason can ever penetrate. Supporters of Israel are up against a poetic truth. We keep hitting it with all the facts. We keep hitting it with obvious logic and reason. And we are so obvious and conspicuously right that we assume it is going to have an impact and it never does."